Like most common names, "Adams" can refer to more than one taxon. They're previewed below, along with 4 specimens. For more detail click through to the scientific names. These are often called Adams. This species occasionally produces important spinner falls. Its spinners may join the swarms of Siphlonurus quebecensis or Siphlonurus rapidus, amplifying the importance of all three species. 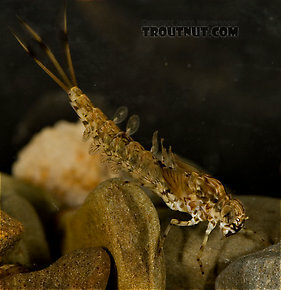 This is the Siphlonurus species I have encountered most frequently on Eastern trout waters. I often find its spinners swarming in a mix with Siphlonurus alternatus, and I have read that Siphlonurus rapidus may join these groups as well. 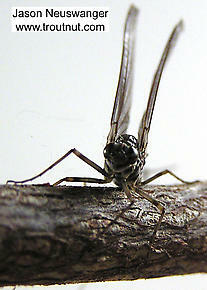 Female Siphlonurus quebecensis (Gray Drake) Mayfly Dun View 3 PicturesThis one hatched in my house after I brought some nymphs home to photograph. These are sometimes called Adams. 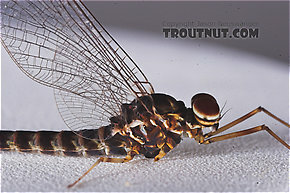 This species may reinforce spinner flights of Siphlonurus quebecensis and Siphlonurus alternatus.